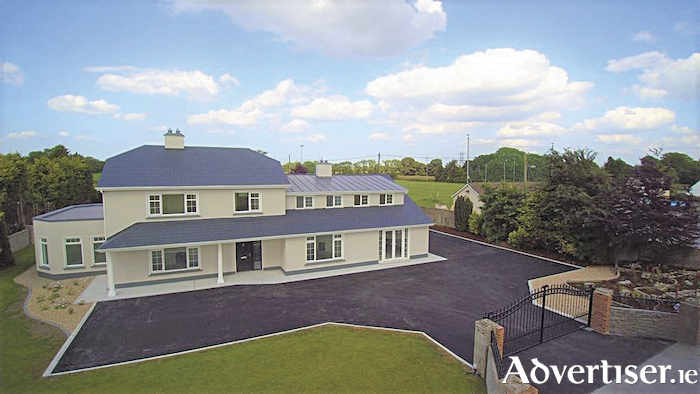 The townland of Cregmore, Claregalway, is the location for this wonderfully redeveloped five bedroom house being offered to the market by way of public auction on December 6 at 3pm in The Galmont Hotel, Galway. The entire property has been re-developed and upgraded throughout earning it an enviable A3 BER rating. Undoubtedly, assisting in achieving this rating is the state of the art air to water heat pump, an A rated hot water cylinder, underfloor heating, individual thermostats in each room, pumped walls, insulated floors, and triple glazed windows throughout. Throughout the redevelopment, an emphasis was placed on ensuring the property was completed to a superior specification. Measuring an impressive c330sq m, this house is spacious with plenty of individual rooms for family living. Downstairs accommodation includes main entrance hall, living room, sitting room, kitchen, dining room/lounge, playroom/office, storage/lounge, downstairs bedroom, and bathroom. Upstairs accommodation includes landing, master bedroom with en suite and walk-in wardrobe, three further bedrooms, main bathroom, and study/office. Selling agent Fergal Leonard MIPAV TRV MMCEPI said: “Externally, the property instantly impresses with new electric gates maintaining its privacy and professionally landscaped front and rear gardens. The property is being sold with a builder's finish so that the new owners get the opportunity to put their own stamp on it. “Ideally located just minutes from Cregmore National school, 7.6km to Claregalway, 6km to Lackagh, and only 15 minutes to Galway city, this is certainly an ideal family home." Open viewing takes place today (Thursday ) from 1pm to 1.30pm. Page generated in 0.1034 seconds.